Characteristics:Single air chamber inflatable lifejacket is designed and produced according to European standard EN396/AI：1998 and refer to international standard MSC.81(70) relevant requirements. It consists of one air chamber which is made of TPU nylon composite material, automatic or manual inflation device, CO2 cylinder, oral inflation tube and outer cover . In emergent situation when falling into water, the air chamber can be inflated by the automatic inflation device within 5 seconds or by manually pulling the toggle. so that ensure drowning people safety . it has the advantages of light weight, small volume , comfortable to wear, easy to use . it is suitable for all kinds of operation personal on the offshore to lifesaving use . it is also use for personal protective sportswear . 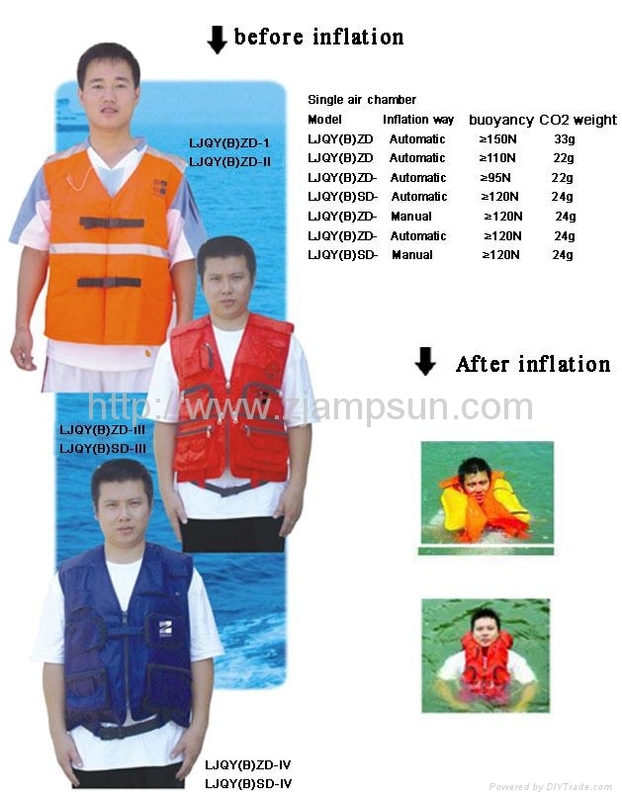 our lifejacket is approved by both China Classification Society and Register of Fishing Vessel of the People’s Republic of China ; our lifejacket is designed especially for fishers , which is approved by Register of Fishing Vessel of the People’s Republic of China. 6) Validity : 3 years.